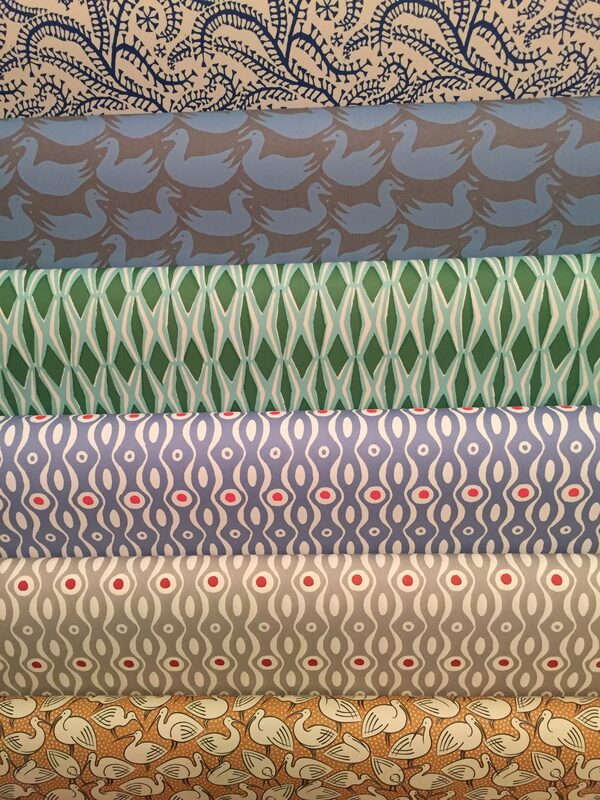 We are gearing up for a busy second half of June! Please come and celebrate Independent Booksellers Week with us, from 20th to 27th June – we have author visits from children’s illustrator Sam Lloyd and historical crime writer Nicola Upson, and a week-long ‘Tiger Who Came to Tea’ trail, as well as the return of our our ‘Bag a Bargain’ sale table. Please see our events page for more details. Also, Friday 26th June sees the Awards Ceremony for the inaugural Steyning Grammar School Brilliant Book Awards, which has seen the bookshop, school librarians and English department staff working together, shortlisting a selection of excellent novels. 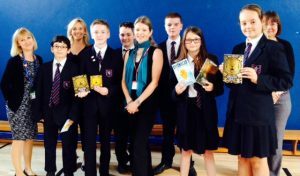 Pupils, staff and parents have been reading and voting on their favourites, and short-listed authors Alan Gibbons, Ruth Eastham and Virginia Bergin have visited the school to whip up excitement. The Awards Ceremony starts at 5pm on Friday 26th, in the Drama Hall at Shooting Field, and is open to pupils, parents, staff, and interested members of the community, please drop into the bookshop for an invitation, or email amuir@sgs.uk.net to reserve your place. Authors Matt Whyman, Tom Moorhouse and Ben Davis will be in attendance. 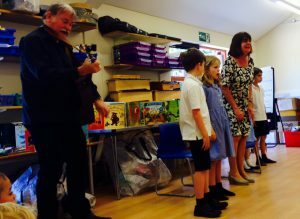 On June 16th, the Year 3 pupils at Steyning Primary School were thrilled to receive a visit from best-selling children’s author Julia Donaldson, accompanied by her husband Malcolm and his trusty guitar! The children joined Julia and Malcolm in singing action songs, and acting out Julia’s stories – much hilarity ensued when head teacher Chris Luckin had to dress up as ‘Lanky Len’ the robber! We look forward to her visit to Henfield St Peter’s Primary School on June 30th. May saw some wonderful events. 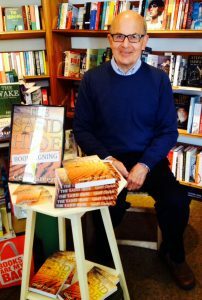 We had a delightful evening at the bookshop with the launch of well-loved local osteopath Geoff Green’s first novel The Sand Hide. Last year Geoff intrigued us with his true life crime story Paying for the Past and now he has published an interesting tale of marital strife and a subsequent flight to the deserts of Morocco. The theme of a desert adventure (but not the marital strife I hasten to say) was taken in part from Geoff and particularly his wife Carol’s interesting experiences in Morocco. The crowd that crammed into the bookshop was testimony to the high regard in which Geoff is held here, and we wish him well with his writing. Our next event was the visit from Sussex crime writing favourite Peter James, who was introducing You Are Dead, his new novel in the wildly popular Roy Grace series. 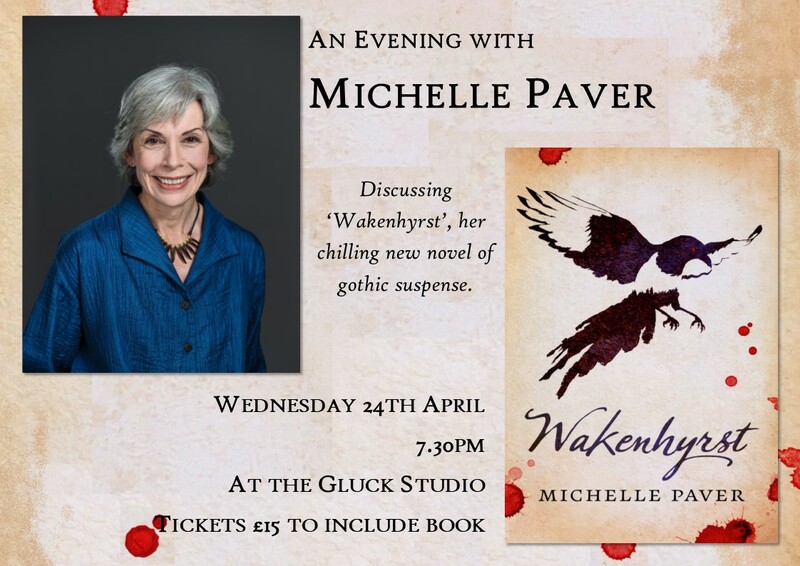 We arranged for his talk and signing to take place at Steyning Grammar School Theatre. 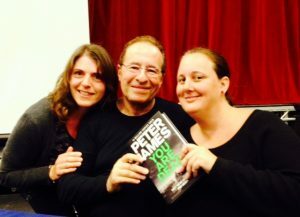 A new Peter James novel is always an exciting event and he has been a wonderful supporter of independent bookshops over the years. The audience of over 200 were treated to a most entertaining talk by Peter and heard about his sometimes hilarious early years working as a film producer and writer in Hollywood and his more recent life as a best-selling crime writer. A fantastic evening and as everyone had a copy of You Are Dead with their ticket and the chance to chat with Peter if they had their book signed, we hope that they went home very pleased. Earlier in May, writer Helen Peters, who wrote bookshop favourite The Secret Hen House Theatre and its recent sequel The Farm Beneath the Water, spoke to a very appreciative group of children at Windlesham House School and Steyning Primary School pupils showed their usual great enthusiasm too when Helen went there later in the day to talk to them as well about her books. Helen, who is an English teacher with two children, grew up on a farm near Ringmer and has based her stories on those experiences.